The emperor left a written record of his military and diplomatic feats in a series of tablets. He successfully abolished feudalism, promoted religion and divided China into 36 states for an efficient administration. 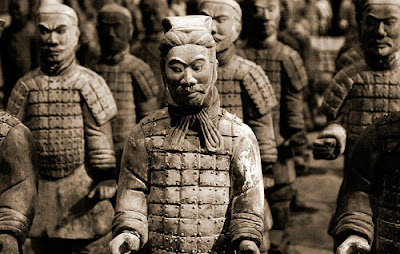 Among the other significant achievements of Emperor Qin Shi Huangdi was the standardization of various systems of writing, weights and measures, currencies and the simplification of the record-keeping methods. 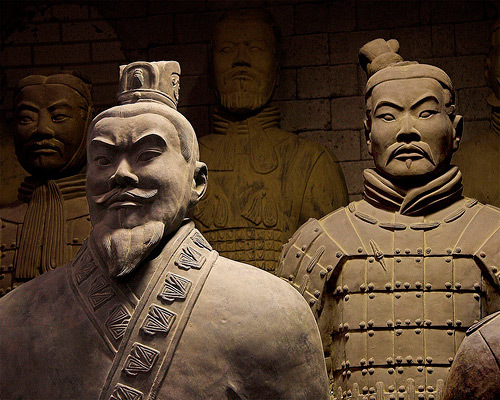 Despite these progressive works, Qin Shi Huangdi was despotic and tyrannical in his rule. 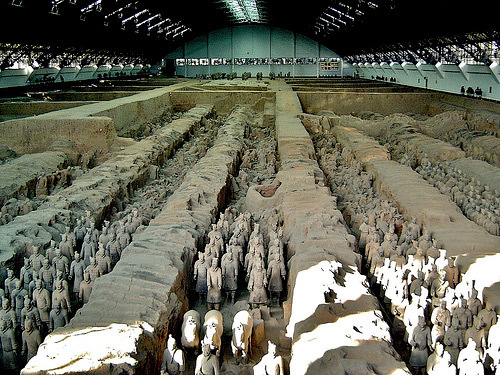 Some of the 7000 Warriors, discovered in 1974. 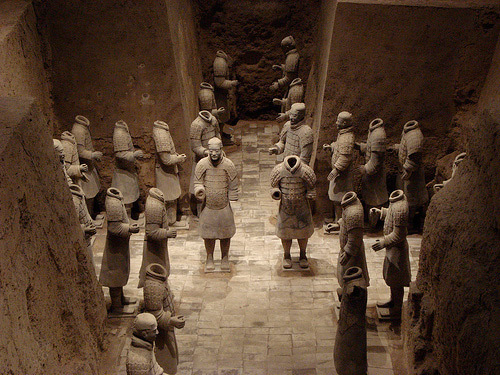 They are guarding the tomb of Emperor Qin Shi Huangdi near Xi’an, Central China. Interestingly, this great builder ordered the erection of his burial chamber right after his ascension to the throne in 246 BCE when he was just a boy of thirteen! Going by the records about his personal traits, it was rather a contradictory step for Qin Shi Huangdi to take because of his search for an immortality formula to help him eternalize his ‘divine rule’. 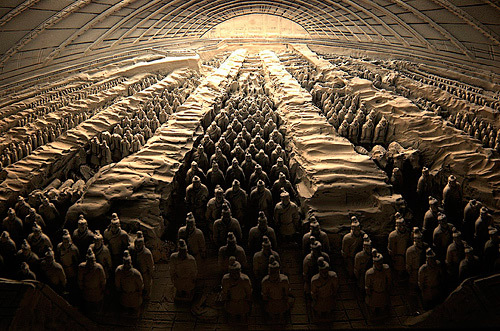 However, the work completed 36 years after it was started and Qin Shi Huangdi died soon after in 210 BCE to be buried in it. The discovery of this archeological treasure happened in 1974, when a team of Chinese peasants abruptly came across the tomb while trying to drill a well. What was most striking about this mausoleum was its huge size and the remarkable artworks stored in it. 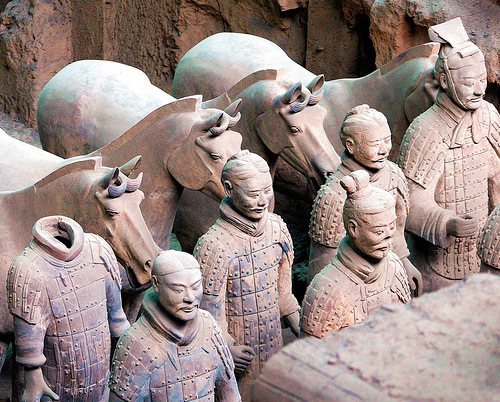 This includes the 8000 life-size army consisting of terracotta statues of men and horses. 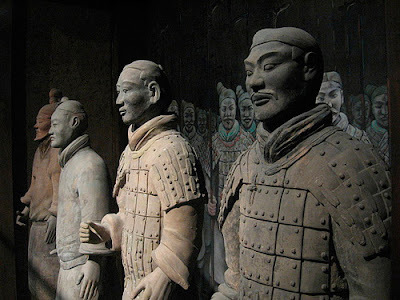 Because each statue was individually built with 3-inch thick terra-cotta clay, you can distinguish each soldier and horse from another in their unique looks, weaponry and dressing. The warriors are positioned according to the ranks they held in the contemporary time. 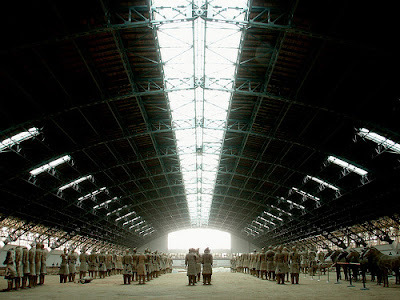 The different sections of the 8000 troops are distributed in three separate chambers. The first and the largest chamber contains the troop of active duty officers, the second chamber is where the reserves are placed while the third small chamber houses 68 elite commanders and officers. All the soldiers face east to protect the afterlife of Qin Shi Huangdi from possible enemy attacks coming from that direction. 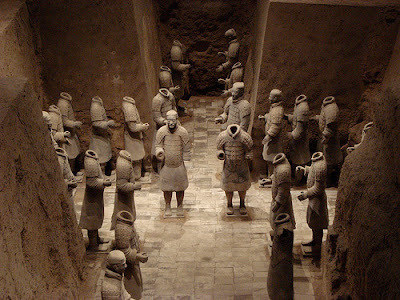 The mystery of this tomb lies in the fact that the three-chamber terracotta soldier complex forms only 1% of the total mausoleum area. The central section of the 90-feet tall mausoleum building beneath an earthen pyramid is still unexcavated. According to the accounts of Chinese historians and popular legends, this part is mapped as a city, with walls, palaces and cemetery and meant for the use of Qin Shi Huangdi in his luxurious afterlife. The rivers and water bodies are sketched with flowing mercury while the sky is represented by constellations of pearls. The underground palace is arguably the most elaborate structure in its grandeur and amenities. It could be an abode of long-buried treasures like precious gems, metals and other wealth. This intricate bronze-lined, waterproof construction extending over four square miles took the labor of 700,000 prisoners of war and slaves for its completion after which they were killed to stop them from divulging the tomb’s secret. 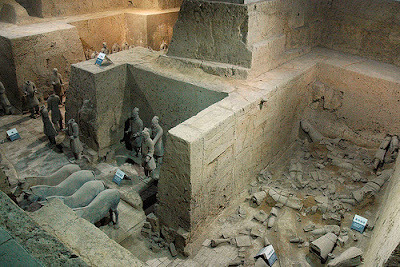 To make Qin Shi Huangdi’s second life as pompous as his life on earth, his mistresses were buried alive in this tomb as well. Even today the excitement over the mysterious secrets of this sophisticated necropolis has not stopped drawing groups of tourists and intellectuals from the world over. As a tourist, you can freely take a tour to the spot although all the details of its excavations are strictly under Chinese authorities. They are still to dig out treasures and valuables from the womb of Qin Shi Huangdi’s mausoleum. Only when the tomb is opened up completely, the myriad marvelous accounts it has commanded will meet the light of truth.